As arguably one of the favorite among all the saints – among Catholics, Protestants and even non-Christians – Saint Francis has quite the reputation. Yet, to quell rampant secular misrepresentations, wisdom dictates that we take a closer look at this multifaceted saint. At first glance, he holds quite the worldly image as a kind of garden decoration who holds bowls of water or seed for our feathered friends. Or perhaps we see him with his arms outstretched, as birds land on them, much like they did on those of Snow White. I, myself, am guilty of having various representations of him in our vast gardens as decoration. But Saint Francis wasn’t some hippy, tree hugging monk who worshiped Mother Earth and all of nature. Rather, he fiercely worshiped God while maintaining a healthy respect and sense of wonder for all of His creation. St. Francis’ appreciation of nature and acknowledgment of its grandeur stemmed from his devotion to living a life devoid of the lures of earthly pleasure, instead focusing on service to the poor and outcast. 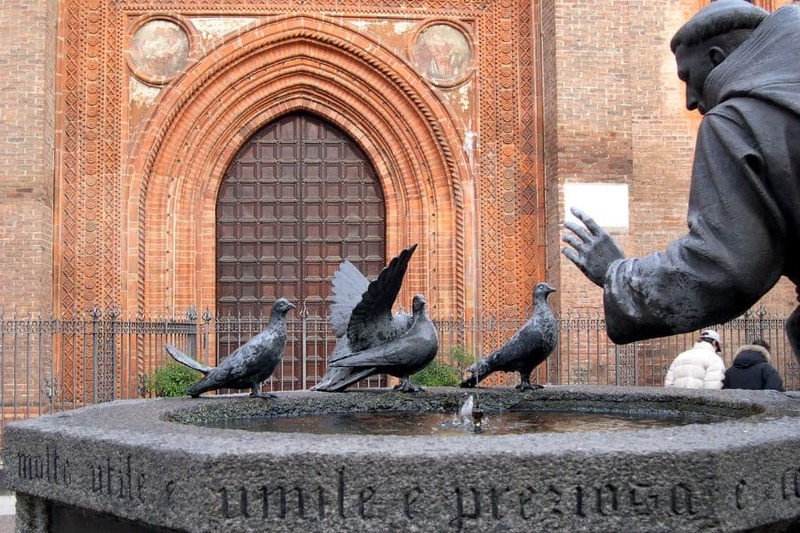 As a former soldier, Saint Francis was also a lover of peace. Contrary to popular belief, however, he neither penned the St. Francis Prayer (it was written much later than his lifetime) nor did he say, “preach the Gospel at all times and when necessary use words“. Although both of these nods to him embody his philosophy, the words are not his own. What Francis did do was amazing enough that there is no need for embellishments. For example, in his fervent pursuit of chastity he is said to have rolled, naked, in the cold snow of winter in order to resist temptation. And although he had many hard sayings and practices, there are also many anecdotes about his life that point to a communion with nature that was unusual to say the least. Yet warm and fuzzy aren’t really a part of his story. Suffering greatly due to the advanced disease of his eyes, St. Francis sought to visit a certain Cardinal. Upon his arrival, the crowds of his admirers were so great that the grape vines surrounding the church were trampled. This very much disturbed the Cardinal who depended on the grapes for wine. After realizing this dilemma, St. Francis promised that, when the remaining grapes were harvested the wine would be more plentiful than ever. This was the case for the years following. According to the writings from Little Flowers of St. Francis, “This miracle teaches us that as, in consequence of the merits of St Francis, the vine, though despoiled of its grapes, produced an abundance of wine, so in the same way many Christians, whose sins had made them barren of virtue, through the saint’s preaching and merits, have often come to abound in the good fruit of repentance”. Actually baptized with the name, Giovanni, Francis came from a wealthy family. His father was a silk merchant who loved all things French, thus, soon after his birth he began calling his son Francesco (Francis). Saint Francis understood that the spiritual battle began with mortification and denying our instincts. He once met a leprous man, while riding along the prairies of Assisi. Terrorized by the wounds of the unfortunate beggar, he nonetheless approached and kissed him. This renunciation of his will changed his life. Inspired by the Holy Spirit, the gesture was Francis’ ‘yes’ which started him on the road to submission to God and therefore, sainthood. Pope Gregory IX initially doubted the authenticity of the stigmata of Francis but after he saw the saint in an apparition, he approved the sacred, holy stigmata of Saint Francis by a special bull. With some of these compelling stories in mind, it is not too difficult to understand why the image of the warm and fuzzy Saint Francis surfaced. He was certainly gifted with an unusual rapport with wildlife and nature. Yet what we must take away from these characterizations is not his love of nature as much as his quest for communion with God – often through His creation. Also apparent is that he genuinely loved the less fortunate – even during his days as a rich young man. His life was far from a fairy tale, yet, it was one to be admired and emulated. As we enter celebrate the feast of this great saint, may we find God’s glory in His wondrous creation. Yet we must also refrain from giving more emphasis to earthly perspectives, and focus more on the wonders of the love Francis emulated for us. Let us take the example of Saint Francis and perpetuate a healthy love of nature, the practice of good stewardship but, most importantly, an unending and unconditional love of God in others. Saint Francis was canonized in the year 1228 by Pope Gregory IX, who came in person to Assisi for his canonization. His feast day is October 4.